I have a ghost pepper plant I'm growing indoors, and I just (5 days ago) transplanted it from a 7" to a 12" pot. Not knowing any better at the time, I broke up the roots a bit during transplant. Now my plant is wilting, but the soil feels moist to the touch still. After reading around a bit, I learned the plant is probably suffering from transplant shock because I damaged the roots, and one way to make sure it recovers is to prune it back a bit so it can spend more of its energy on growing out new roots. Everything I found about how to prune chili plants is for overwintering them or seasonal pruning, though - not shock recovery. Can I use the same strategies for where to cut my plant? Pruning a plant suffering from transplant shock is often a good idea. If your plant is recovering, I wouldn't worry about it too much, though. Just prune according to normal guidelines for peppers. In my experience plants that have experienced transplant shock can benefit from pruning in order to reduce the shock, and also to promote new growth if the plant was stunted from the shock. However, if the plant is too young, pruning it is not advisable (and may harm the plant). Young leaves are more adaptable to light after a transplant, anyway. It's the old leaves you should worry about, especially if they've wilted severely. Your plant looks plenty old, though (I don't think pruning it would hurt it, if you're judicious). Your plant doesn't appear to be wilting to me, though. Maybe it's a picture of what it looked like beforehand. You have to understand, though, that pruning is more advisable (in my experience) before the transplant than after (but after is better than nothing); however, if you can avoid transplant shock, pruning isn't necessary for transplants. The more leaves your plant has, the more photosynthesis it's going to attempt to do (and the more water it will need to do it). If the roots are shocked from damage, the leaves may attempt to photosynthesize and use up all the available water, without being able to get more from the soil. This can cause the plant to wilt (and sometimes die). However, it's important to realize that drought-stressed plants can close the stomata on their leaves, which prevents water from going out, but it also prevents photosynthesis (but from my observations, I'm guessing this happens after the initial shock, or else the plants wouldn't wilt). It also seems that not all plants open their stomata again any time soon (this is a hypothesis based on the fact that transplant shock can stunt plants, while pruning those plants such that they grow new leaves can reinvigorate them). I'm guessing some plants are capable of opening them pretty quickly, though. You may not realize this, but there's another factor in transplant shock that isn't widely known: light. When you pull up a weed and throw it in an area with blazing full sun, it will wilt very, very fast, and die (also very fast). If you had taken the same weed and thrown it in a shaded area instead of a sunny one, it would have looked alive much longer. The same is true for plants experiencing transplant shock. Strong sun and strong light worsen it. Shade can prevent it from happening in the first place. One of the reasons that pruning before a transplant is often a great idea, is because there are fewer leaves for the light to shine on (and less light to worsen the transplant shock). Pruning the transplant afterward can help if the plant is still in the light, or if the plant is stunted, but otherwise, it's probably not necessary. You should not put new transplants in full sun, nor close to a grow light. They still need light, of course, but I've found that plants tend to help if they're shaded for a while after the transplant. I haven't found the sweet spot for peppers, but for tomatoes, it's two days or less (I'm not sure how much less). It's important to know, however, that a plant that has experienced transplant shock after it has recovered will often not grow as well as a plant that had never experienced it. Pruning helps them to overcome this, in my experience. The older leaves are usually the ones that wilt the most during shock (and these are normally the ones where removing them helps the plant to recover, in my experience). However, just pruning as you would usually prune helps, too. Just be sure to leave enough leaves on for the plant to survive (if you take them off, on a bigger pepper like yours, they might grow back—but it's a good idea to leave a number of them, if you can). Newer leaves are more adaptable in my experience, and are not in need of pruning, unless they need to cut off with branches to make the plant bushier and more healthy). 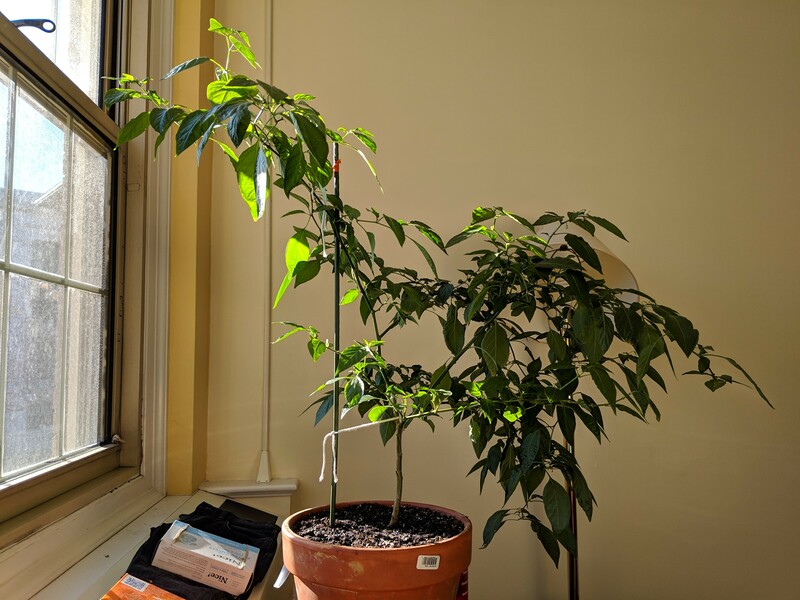 Anyway, I'm not an expert on pruning peppers, but if your plant is still alive, since you asked the question a while ago, your plant isn't in desperate need of immediate pruning (and I would only prune if it's not growing, or if it's still wilting, where the wilting is caused by the transplant shock). Some people say that giving the plant loads of water is all you need to do (and sometimes, that helps). However, it's not what I recommend. I recommend just giving it a normal (but liberal within the normal range) amount of water. The following may also help: Give the plant potassium sulfate (which can help it to absorb water more easily), if you have some handy; other potassium sources may help (I've had success using a little wood ash in this regard), but be careful of the salt index for some potassium sources, and don't add a full general-purpose fertilizer during transplant shock; you don't want to add nitrogen. I'm not an expert on over-wintering peppers (nor am I that experienced with pruning peppers in general, although I have done it a number of times). So, I'm not sure what sources you've found for pruning them. I see sources online for pruning peppers earlier in the season. I searched and found an article on pruning peppers early in the season, which basically says to wait until the plant is at least a foot tall, where it has a Y shape, and prune off the small branches and any suckers (not the strongest branches). I don't know how true this is (I'll have to test it), but they say not to damage the Y part of the plant, or the plant will perform poorly. They say you can stop pruning when the plant sets fruit. It talks about pruning later on, too, but I think your plant hasn't set fruit yet. Not the answer you're looking for? Browse other questions tagged pruning transplanting peppers recovery or ask your own question. Should we help seedlings recover from a bent shape? Are there any methods of fixing transplant shock? How do I transplant a 20 year old Satsuma tree? Is total darkness acceptable for tomatoes to recover from transplant shock? How can I transplant sprouts growing from a Mimosa stump?